Youth at the Stronger Together Summit participate in an Oreo challenge at the Ladies of Virtue booth. The summit was organized by Ladies of Virtue, Chicago City Clerk Anna Valencia and mentoring organizations focused on girls of color. 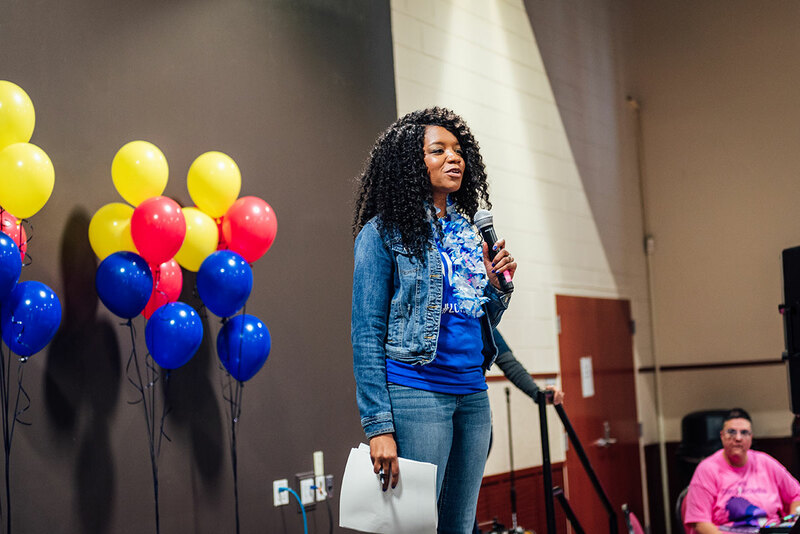 Photo Above: Jamila Trimuel, founder of Ladies of Virtue, speaks to the participants at the Stronger Together Youth Summit. 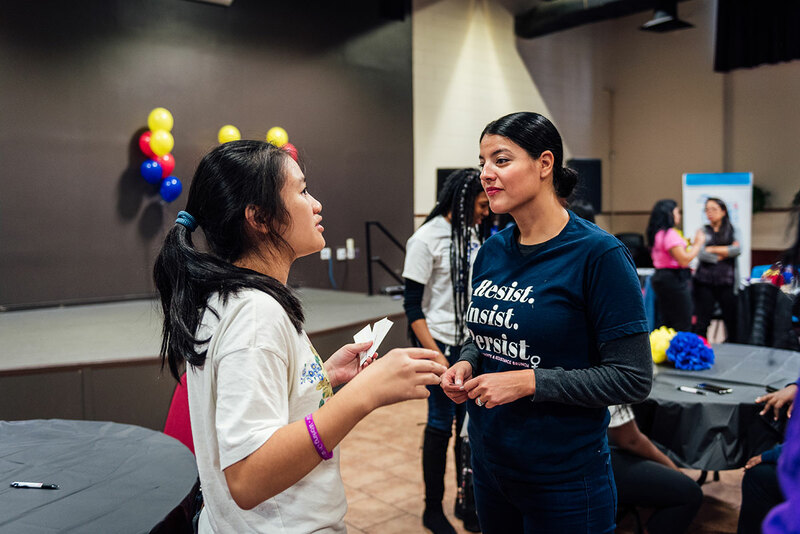 Photo Above: Cindy Ngo and Chicago City Clerk Anna Valencia exchange business cards during an icebreaker activity at the Stronger Together Youth Summit. The future looks like teen girls of color finding and making their voices heard. It looks like adults listening to the next generation. And it looks like comradery in the name of feminist progression. Such is what Ladies of Virtue founder Jamila Trimuel and a group of teen leaders proved at the recent Stronger Together Youth Summit. The fall summit for girls featured workshops on dating and relationships, college and career prep, financial literacy and proper usage of social media. 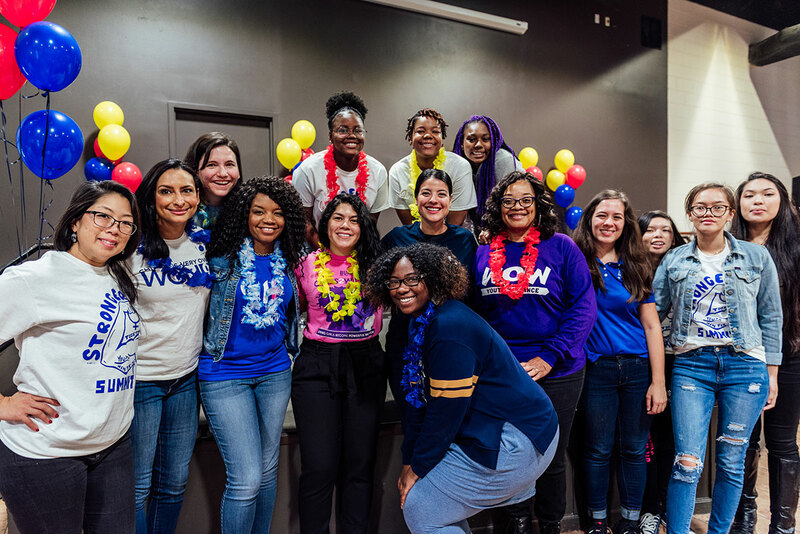 It was chaired by Ladies of Virtue, an African-American mentoring and leadership program for girls ages 9 to 18, and Chicago City Clerk Anna Valencia. Ladies of Virtue and the Chicago City Clerk organized the summit with the help of other mentoring organizations that focus on girls of color, including Youth Guidance’s Working on Womanhood program, Build, the Chinese Mutual Aid Association’s Young Women Warriors program, Project Style and Stand Out. 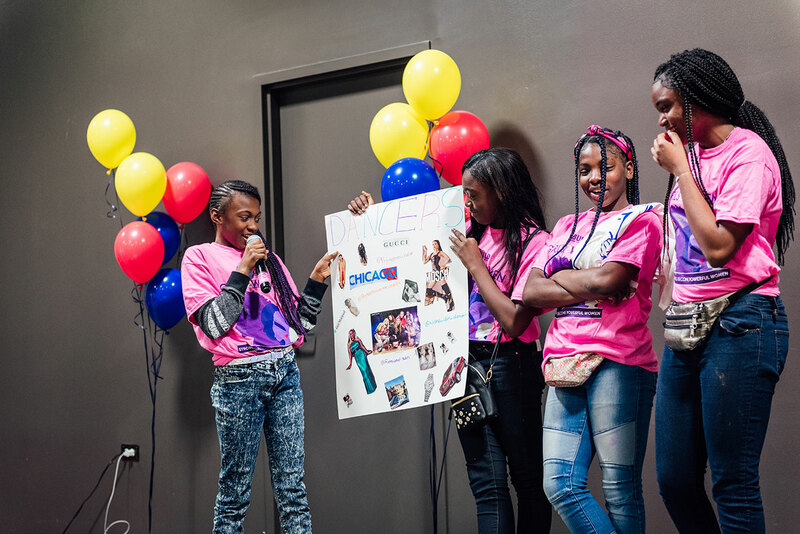 On May 8, 2018, Chicago City Clerk Anna Valencia held an On The Table luncheon to empower young ladies of color to speak about the issues that affect them most. The teen girls in attendance refused to let their connection fade and insisted that the conversation continue. So, Valencia and Trimuel committing themselves to the teens’ vision by organizing a summit that was funded by a $5,000 Acting Up award from The Chicago Community Trust. The Stronger Together Youth Summit, held October 27, 2018, at the Charles Hayes Investment Center, 4859 S. Wabash Ave., was a day dedicated to creating space in which 75 teen girls of color from across Chicagoland could connect, empower, and learn from each other. At the same time, they were mentored by women of color across varied fields. Journalists Cortney Hall and Lourdes Duarte from WGN-TV also attended the summit to give encouraging words to the girls. The Trust awarded $150,500 to 37 community projects that will support tangible activities benefiting neighborhoods and public good. These ideas were sparked through the Trust’s fifth annual On the Table, a citywide event during which Chicago-area residents came together on May 8, 2018, in mealtime conversations to engage in meaningful dialogue, develop new relationships and inspire action to make a difference in their communities. Photo Above: Committee members introduce themselves at the Stronger Together Youth Summit. Featured from left to right are: Keturah Funches of Ladies of Virtue; Monique Harvey of Youth Guidance’s Working on Womanhood program; Janet Pham of the Chinese Mutual Aid Association’s Young Women Warriors program; Melanie Jones of Ladies of Virtue; and Nga Dang of Young Women Warriors. Photo Above: Youth present art boards at the Stronger Together Youth Summit. The summit’s entire day of programming came from the five teen girls who attended Valencia’s luncheon. 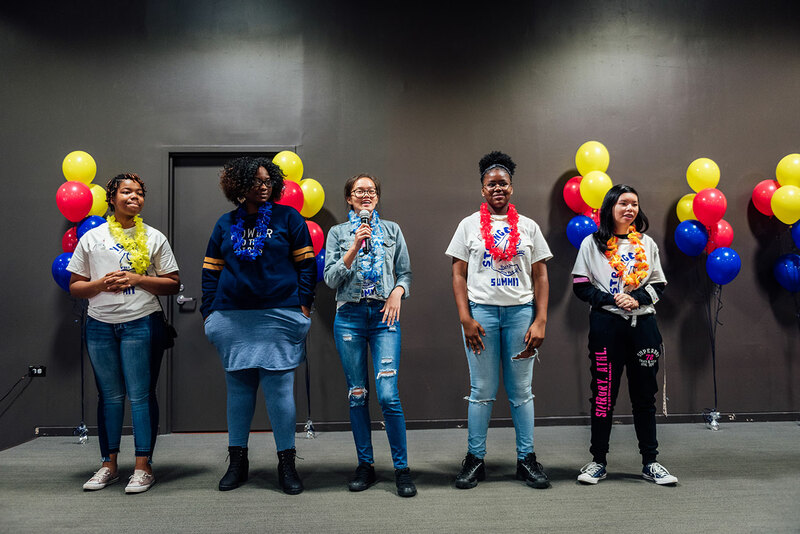 They formed a summit youth committee that generated the themes, program direction and workshop topics while the adults formed their own committee solely for the purpose of supporting the teens’ vision and voices. Hasanah Oji, 17, of Chicago’s Northwest Side said she enjoyed the dating and relationships session. At the end of the summit, the girls gathered into groups and created vision boards representing each other’s individuality and shared connections. As the teen leaders look to the future, they hope that the summit represented a beginning rather than an end. Photo Above: Organizers and sponsors pose for a photo at the Stronger Together Youth Summit.